Built for high-torque and heavy-duty requirements, the 82 Series PTO features a lever or air shift cast iron housing and a single or dual optional hydraulic pump mount. Muncie Power Products has the ability to provide a wide variety of cable controls. A constant drive power take-off, the CD05 Series PTO is designed to fit tight mount applications. Without loss of torque or horsepower, the CD05 uses the same components as the CD10 but is approximately 15 percent smaller. Designed as a functional alternative to front, crank shaft driven hydraulic pump applications, the CD10 Series PTO boasts an ample capacity for heavy duty applications without obstructing service areas of the truck engine and cooling system. The CD40 Series PTO is designed for maximum output torque for live engine driven equipment using Allison World or Caterpillar automatic transmissions. Built with the same gear and housing designs as the CS41, the CD40 Series is used when maximum power is necessary and PTO disengagement is not required. Constructed with large gears, the CS10 Series PTO is built for heavy duty applications. The CS10 features a drag brake and an output shaft designed around popular hydraulic pumps. For a more compact installation, the CS11 is a remotely mounted solenoid option. When you need the max power from an Allison 3000 or 4000 and Caterpillar CX transmission, the CS40/41 Series power take-off delivers. Constructed with the widest gears possible, the CS40/41 is built for maximum strength, noise reduction, durability and the highest output torque rating available. 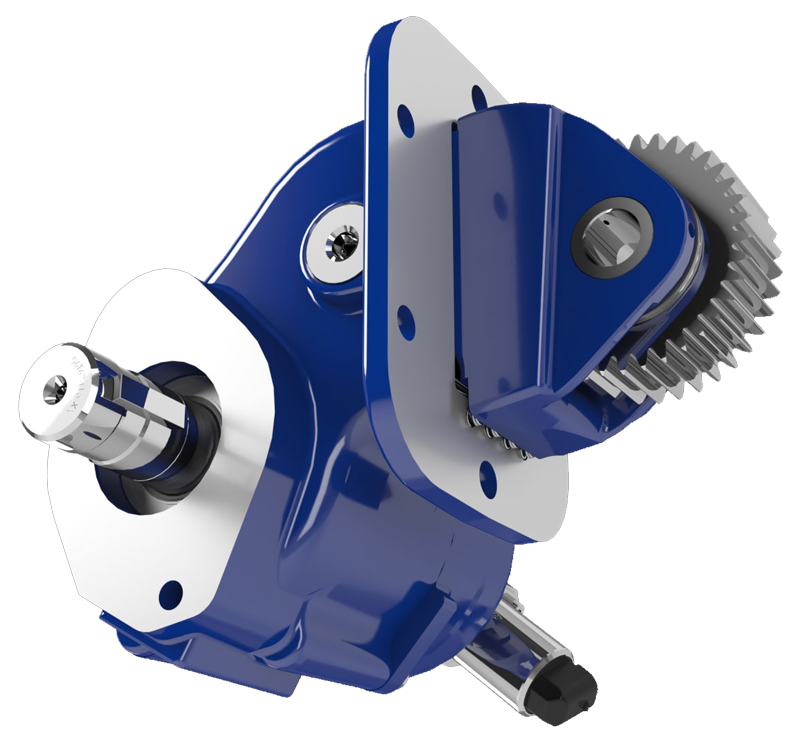 The EX Drive is designed to fit on Allison 3000 and 4000 series transmissions with retarder or cooler, and allows for large gear or piston pumps to be direct mounted, eliminating the need for timely driveline installations. The FR and FA Series power take-offs were designed in cooperation with Ford Motor Company's engineers to fit the 5R110 "TorqShift®" and 4R100 automatic transmissions. Muncie return line filters provide an effective and economical means of protecting and prolonging the life of any hydraulic system. The MLSM Series Live Pak pump system provides protection to hydraulic components without the loss of operator control. The two position, two way valve provides a simple means of directing oil flow into two separate hydraulic circuits or can be used as a low pressure bypass back to the reservoir. The Optimum X Series gear pumps/motors offer premier performance for a wide variety of applications across several industries. Featuring the innovative OPTI-Grip® technology, the Optimum X Series exemplifies strength, endurance and rigidity making for long lasting units even in the most extreme conditions. The X Series is the middle range of the Optimum group, providing 9 displacements to cover light to heavy flow and pressure requirements. Ultimate power and performance in a small package best describes the F4 Series gear pumps. The pressure balanced bushing blocks and sleeve bearings provide both long life and high performance. Muncie clutch pumps provide hydraulic power at the flip of a switch. Clutch pumps can be used in situations where a PTO aperture is unavailable or difficult to access. Although normally belt driven, clutch pumps may also be shaft driven from the engine crankshaft. Dry valve pump systems lower operating costs by drastically reducing horsepower draw in the "Off" mode, thus saving fuel. Muncie’s PTO shaft extensions for the Allison 3000 and 4000 Series transmission provide easier hydraulic pump installation by moving the hydraulic pump mount to the rear of the transmission. Shaft Extensions are available for most Allison 3000 & 4000 Series transmission applications and popular pump mounts. The Muncie PV Series pumps consist of the PVL, PVJ, and PVE variable displacement piston pumps that are used in closed center hydraulic systems. SS88 Series Split Shaft PTOs are used to provide two 8-bolt PTO apertures for a variety of heavy duty applications and auxiliary power drives.